The Greater Terran Region (GTR) is a large region that is mostly packed with skyscrapers, supported by an incredible transportation system. This award-winning City Showcase was updated both at Simtropolis and SC4 Devotion. 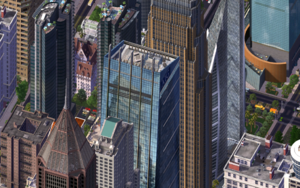 It has also been showcased on Skyscrapercity and CSG Design. Other than the dense skyline, the Greater Terran Region is famous for its impressive transportation networks and complicated infrastructure. The GTR boasts a web of highway networks, bullet train lines, a complex subway system, as well as standard rail and bus routes. Like many modern major cities, the GTR has special HOV lanes for restricted use, collector/express highway setups, light rail systems, massive mass-transit hubs, ports and airports. Haljackey's planning style is quite simple, but has complex results. A very leaninent mayor, he zones high-density nearly 100% of the time. This allows the Sims decide what they want to put in the zones, anything from a shack to a towering skyscraper. Haljackey presents his images in their natural resolution (most 1920x1200), not compressed or resized, and can be accessed when the smaller images on-site are clicked on. The GTR is also well known for its videos. The GTR started in mid 2006, when Haljackey downloaded and hand-terraformed Simtropolis' most downloaded map: Eaton. Early work in the GTR mainly consisted of the development of transportation networks and generating enough demand to build skyscrapers. Much of the GTR's early work was showcased in the newly founded Show us your Interchanges thread at Simtropolis and received a lot of positive feedback from the community. Haljackey was eventually asked in that thread if he had a City Journal, and that prompted him to start one. He spent much of late 2007 preparing the GTR as well as looking at other City Journals for pointers. The City Showcase officially began on December 18th, 2007 on Simtropolis and was very popular on the site as a new City Journal. Haljackey decided to showcase the GTR to the audience at SC4 Devotion, first updating on December 28th, 2007. On SC4D, the new Mayor's Diary was not very popular because all the updates were mere copy-and pastes from older updates at Simtropolis, and due to low popularity Haljackey decided to cancel updates at SC4D. The MD was then moved to the inactive MD section and stayed there for some time. It wasn't until the Simtropolis Site Hack that the MD returned to active status. Haljackey lost a lot of content on Simtropolis and decided that continuing it at both sites would be the best way to retrieve content if it was lost on either site in the future. The GTR returned to SC4D on May 27th, 2008, and new updates were posted here as well as on Simtropolis. Fully revived, the GTR became a hit with the SC4 community. On November 22nd, 2008, Haljackey updated the GTR for the 100th time. The 100th update special contains just about everything one can put into a City Showcase, and shows how much the region has grown since the first update. Update 100 was the City Showcase's largest (now update #50 due to the GTR's retirement reorganization). In January 2009, the GTR was showcased on SC4D's Of Special Interest This Month (OSITM) section. In February 2009, three 2008 Trixies were awarded to the GTR: Best City Journal, Best city sprawl in the City Journal and Slogan of the Year. On March 21st, 2009, GTR 2.0 was officially launched on Simtropolis when ST 6.0 went public. It resided away from the forums, in the new City Journal section. The GTR was officially retired on April 11, 2010. The last update was on August 30, 2009. As part of retirement, all other GTR threads around the net were removed and their content was added to the MD Archives on SC4D. This thread was also completely reorganized, and the number of updates were reduced from 121 to 80. On September 24, 2012, the GTR was temporarily reactivated to include earlier entries lost by a hard drive crash and the Simtropolis Site Hack. Haljackey managed to find backups of the original Cache which included the text and images from over 20 pages of the Simtropolis thread. These entries are now being added for completion reasons and as a part of Haljackey's SimCity 4 Archives project. This page was last modified on 27 September 2012, at 22:55. This page has been accessed 44,922 times.